The H. pylori test checks for Helicobacter pylori stool antigen to help identify an H. pylori infection. What is an H. pylori test? The H. pylori test checks for an H. pylori infection in the stool. Why is an H. pylori test important? The H. pylori stool test is an accurate diagnostic test for H. pylori. Is any special preparation needed for this H. pylori test? If you are on proton pump inhibitor medications, it is recommended that you wait 2 weeks after stopping these medications before getting an H. pylori stool test. This H. pylori Test is a stool test. The H. pylori test, sometimes known as a H. pylori stool antigen test or Helicobacter pylori test, checks for evidence of an H. pylori infection in the stool. H. pylori, or Helicobacter pylori, is a bacteria typically found in the stomach. H. pylori is a gram-negative bacteria that has four or more appendages (flagella) that enable it to move easily. H. pylori also employs its flagella to burrow into the stomach lining to get away from the highly acidic parts of the stomach and help it anchor itself as the stomach is constantly moving. H. pylori also protects itself from acidity in the stomach by creating an enzyme called urease which produces ammonia to help buffer the stomach acids. Part of the damage caused by H. pylori in the gastrointestinal tract is from ammonia production as well as local inflammation from its burrowing. According to one study, approximately half of the world's population has H. pylori in their body. While most people with H. pylori in their gastrointestinal tracts do not have symptoms, H. pylori can cause a variety of symptoms, particularly in new infections. Symptoms of an H. pylori include chronic gastritis, cramping, bloating and ulcers. Longer term, chronic H. pylori infections can increase the risk of stomach cancer secondary to ongoing inflammation of the stomach lining. H. pylori stool testing is the preferred method and is a sensitive way to check for a Helicobacter pylori infection, monitor the response to treatment, and confirm H. pylori eradication one month after treatment has been completed. To get an H. pylori test near you, simply order online and get tested at your selected Quest Diagnostics lab. The H. pylori test report will be available for download once it is available. 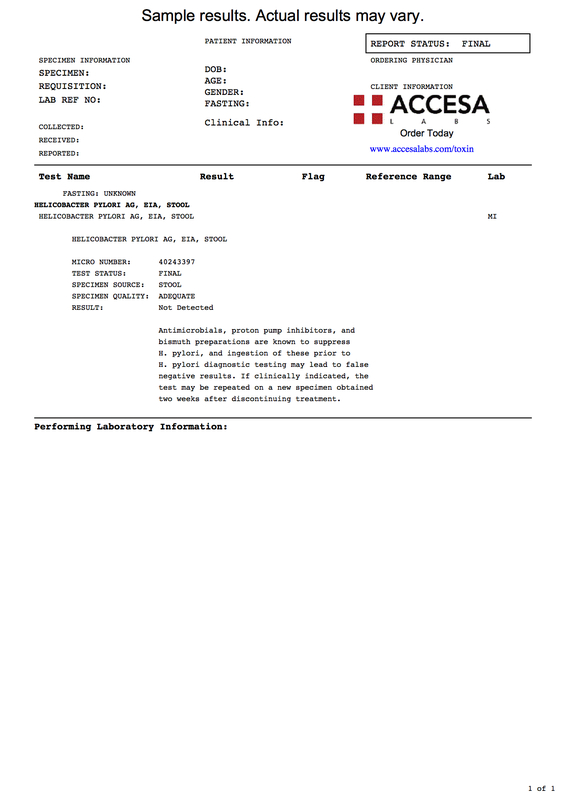 As can be seen on the H. pylori sample report above, a result of not detected means that no H. pylori was identified in the sample provided. Some studies also recommend H. pylori stool testing in cases of chronic gastric, gastritis, or duodenal ulcer. An alternative to H.pylori stool testing is the H. pylori breath test which might be a suitable option for some people. Historically, the H. pylori antibody blood test was used but that form of testing is typically not recommended anymore. The H. pylori test does not require any fasting before the testing is performed. False negative results can occur if someone is tested after recently using a proton pump inhibitor (PPI), bismuth preparations or antimicrobial medications. In those instances, retesting after two weeks should be considered in those situations if the initial result is negative. Following treatment, it is recommended to get an H. pylori retest after four weeks to confirm that H. pylori eradication occurred. To test for a wider range of toxins, please refer to the toxin panel test. H. pylori Test at Guaranteed Prices.